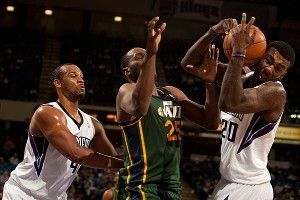 Thursday night, the Utah Jazz trailed the Sacramento Kings by a point with 4.1 seconds to play. 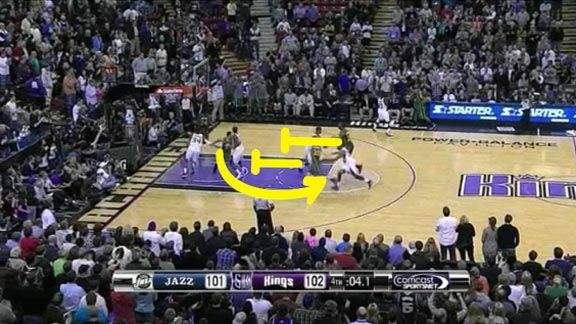 Marcus Thornton had just made a tough shot to give the Kings the lead, and, in all likelihood, the win. 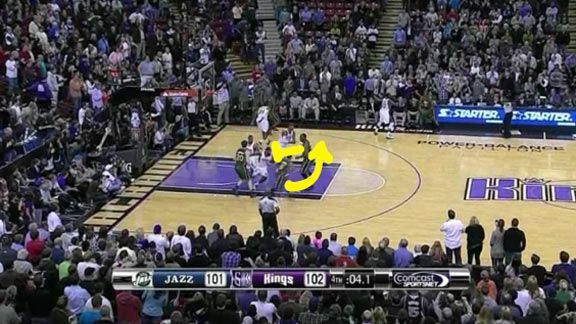 The Jazz had one last chance to get a good look at their own game-winner. Coach Ty Corbin drew up a nice screen-the-screener play for Devin Harris, which worked, and the Jazz managed to eke out the win. Before the play starts, the Jazz set up with Paul Millsap in the opposite corner, Devin Harris in the middle of the paint, Gordon Hayward near half court, and Al Jefferson at the top of the key. When the inbounder looks to pass, Harris turns around and sets a cross screen for Millsap. 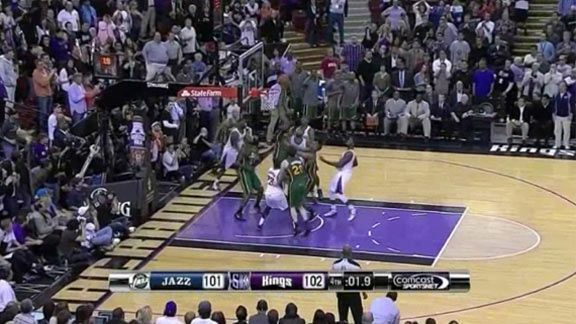 Meanwhile, Jefferson sets a back screen for Hayward, and it seems as if Hayward could be looking for a backdoor lob. 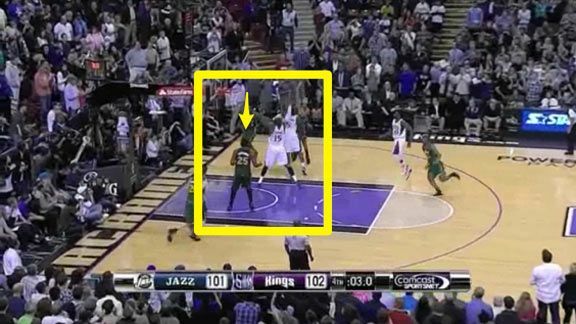 But Hayward isn’t looking for a lob. He comes off Jefferson’s back screen and runs toward Harris’s defender, John Salmons. Hayward sets a solid screen on Salmons while Jefferson dives into the paint and sets a second screen for Harris, so that after Harris screens for Millsap, he receives a staggered screen from Hayward and Jefferson. Why a staggered screen? The Jazz really wanted to knock Salmons off his path. Salmons was attempting to use a defensive technique called locking and trailing to guard Harris. He wanted to stay as close as possible to Harris to prevent him from creating space off screens. When Harris makes the catch, Salmons wants to be right in front of him, ready to keep Harris from getting to the rim. After Hayward’s screen, Salmons is still locked in on Harris, but right after fighting through that first screen Salmons gets drilled by Jefferson’s second screen. When Harris catches the inbounds pass, Jefferson’s screen has created a lot of space for Harris to operate. He turns the corner and drives toward the rim, forcing DeMarcus Cousins to help on Harris to prevent him from getting an easy game-winner. As he approaches the basket, Harris can decide to shoot or pass to Jefferson, who has become wide open because Cousins left him to help on Harris. Harris decides to dish to Jefferson. Thanks to the space created by the Jazz’s staggered screen and the pressure Harris’s penetration put on the defense, all Jefferson has to do is stand in front of the rim, catch the ball, and finish. That’s exactly what he does, and the Jazz take the lead with 0.9 seconds left. 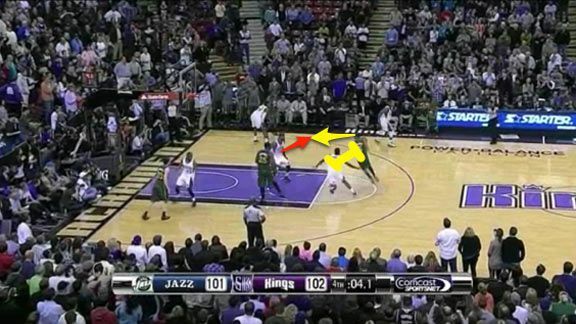 This is great play design by the Utah Jazz. Screen-the-screener action is almost always effective at freeing up a man, and it works here for Harris. The fact that the Jazz set a staggered screen for Harris also helped him shed his man, Salmons, who was really committed to staying with him on the play. Salmons fought through Hayward’s first screen but got stuck on Jefferson’s second screen, and this allowed Harris to curl into the lane unguarded and force Cousins’s help. That help made Jefferson’s game-winner such an easy play.